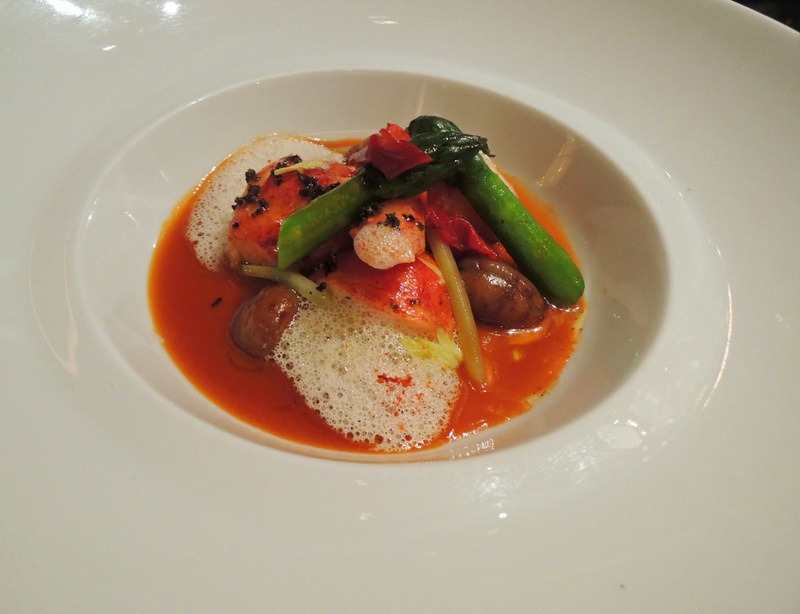 One of the many things on my foodie bucket list was to dine at a 3 Michelin star restaurant. 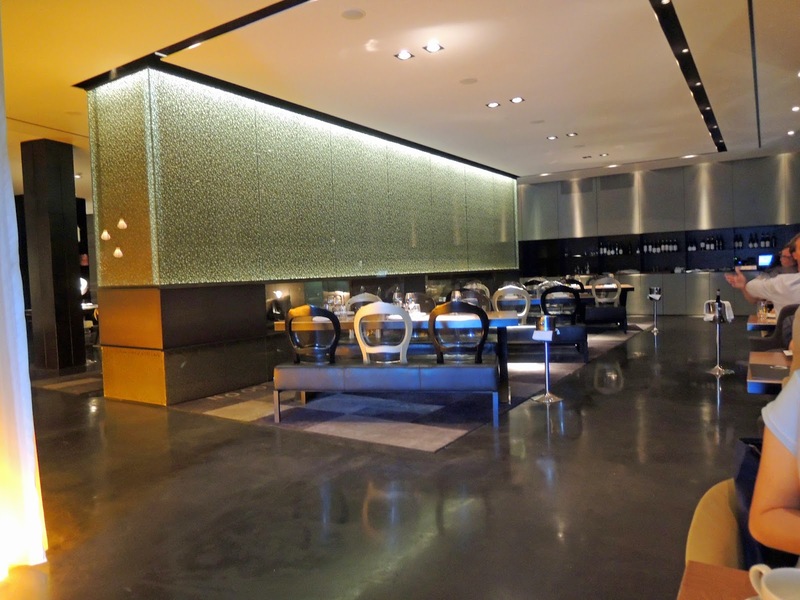 I had my chance a few years ago on our trip to Las Vegas but at time we only had only stumbled upon Robuchon and there was only a day left and there were no places on the reservation list. 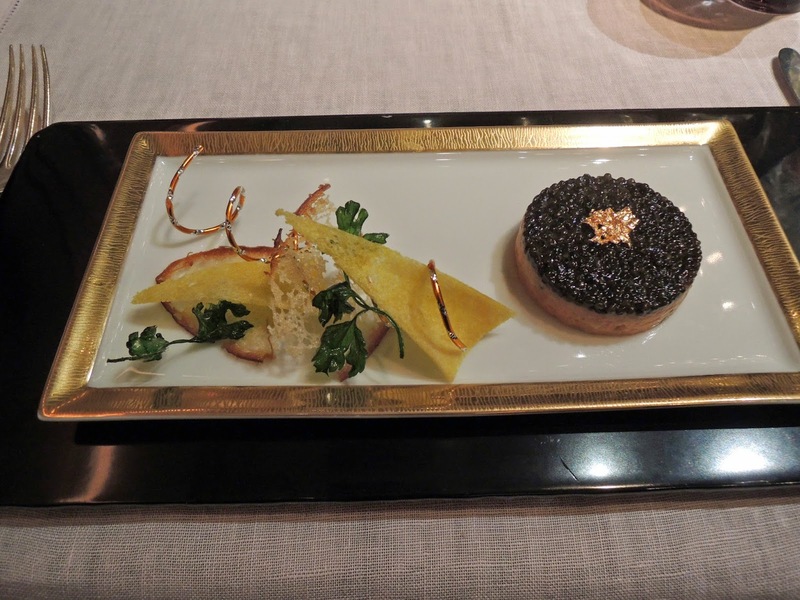 After recounting our trip to my friend, he asked "OMG did you go to Joel Robuchon? I had the brioche from the bread cart and nearly cried". Since then I had been plotted my return to Las Vegas just to try this restaurant. 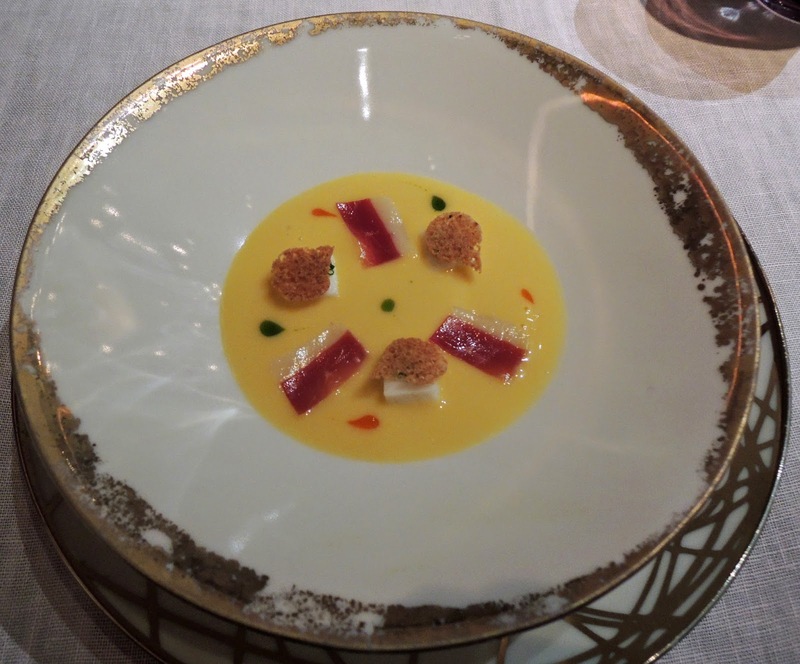 I had no idea what to expect out of my experience at a three star Michelin star restaurant. I only knew that the food would be top notch and I was told that the service was a completely different level of experience. We had an idea when my wife asked the maître d' "can I...." his reply before she finished was "Yes of course! we never say no!". The bread cart was quite a site. Usually you get a bread basket, if you're lucky it contained a couple of selections of bread. A whole cart was presented to us with breads of all sorts. It was preceded with a cart with what I can only describe as a "tower of butter" which the was artfully carved with a spoon and presented with fleur de sel and a small bowl of very delicious extra virgin olive oil. The cart contained every bread I could think of. It was hard to choose even though there seemed no real limit. 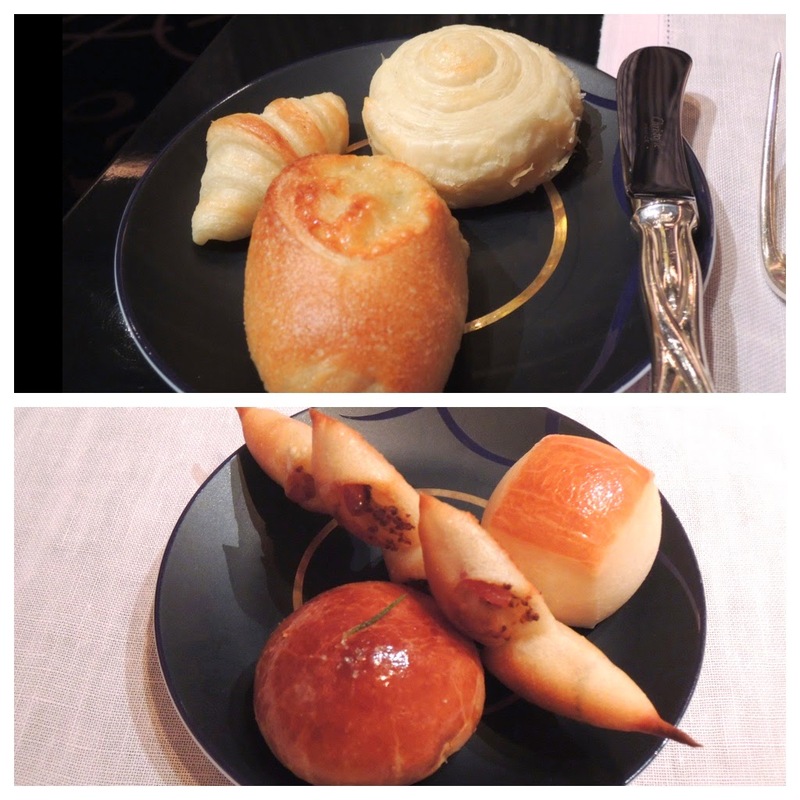 I picked a classic brioche, mini bacon pain d'epi, and the square "milk bread". We also sampled croissant, cheese brioche, cheese pastry bread. Each piece was delicious and had their own characteristics. The brioche had a chewy crust and a soft pillowy inside the croissant was every bit as good as the full sized versions I had in Paris. Wow, what a start to dinner. They toasted our first selections and never hesitated to offer more when we glanced over at the cart. We started with an Amuse Bouche of corn veloute with smoked duck. The white square bits were described as some sort of savory marshmallow. Very delicious. I had two choices for appetizer. I opted for Le Caviar Imperial: salmon tartare with osetra caviar. The salmon was mixed with some tobiko in order to give it a crunchy texture. I really enjoyed this dish super decadent. For my second appetizer I got L'Oursin, sea urchin with langoustine and pureed cauliflower on top of a vinegar gelée and seaweed. I love sea urchin and this was by far some of the freshest tasting I've had. The vinegar gelée was an interesting texture the slight sour flavor was great with the langoustine and fat of the sea urchin. I was amazed at the precision on the plating, each of little mini kisses of cauliflower puree were perfectly spaced and dotted. My wife got the Le Foie Gras De Canard, grilled foie gras bell pepper confit in acacia honey. She usually hates bell pepper but however they treated it she found it delicious. She felt the Foie gras was too rich, I think when paired with honey I could see how it was a bit overwhelming, I dutifully took one for the team and helped gobble it up, I didn't have a problem with "too foie gras". My first main course was a Caramelized black cod in Malabar pepper sauce with bok choy served with a lobster roe chip (you can do that?!). The fish was perfect, the sauce amazing. This is one of those things that I cannot describe it's just burned into memory. Second main course was a Sliced grilled beef rib-eye, bone marrow condiment with daikon and matsutake mushrooms. The beef was perfectly cooked and had soft melt in your mouth texture. Not one bit tough but a perfect crunchy au poive crust. You see those chip looking things on the upper right corner, those were tiny eggplant slices lightly fried. It was served with a creamed potato which they didn't spare on the butter. My wife's main dish was Lobster roasted with chestnuts and asparagus with shellfish jus (which tasted like they had some saffron in it). 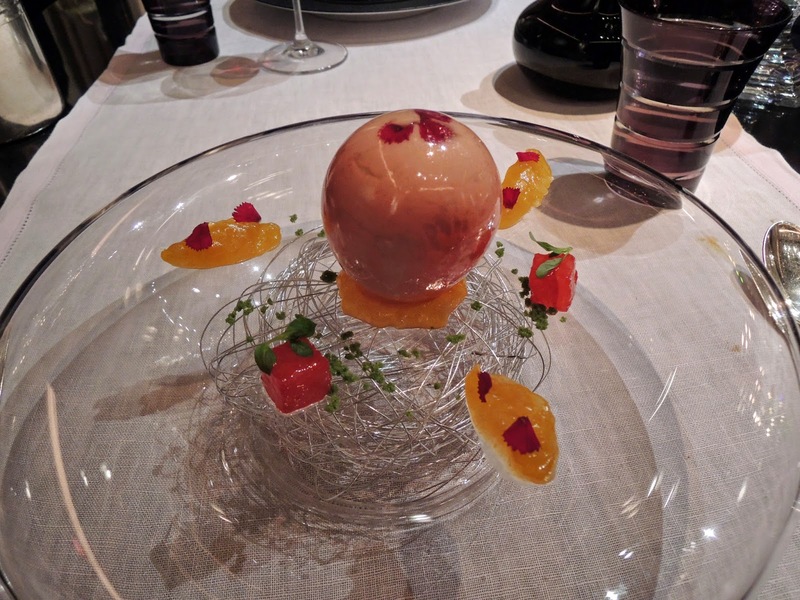 Finally (sort of) dessert La Sphére, bubble sugar sphere with campari sorbet, kaffir lime creme. I really hesitated to break into my dessert. The sugar glass sphere was filled with the kaffir whipped cream and a grapefruit sorbet (not campari). It looked like a Christmas ornament. It was served with a citrus marmalade and (somehow) perfectly cubed grapefruit and mint sugar crumbles. We also had the Lychee sorbet with fresh raspberries. If that wasn't all enough they had yet another cart with just miniature sweets. This is what we ended up picking. Each bite was delicious and the attention to detail was delightful (just look at the lady bug "mini chocolate macaroon"). They offered us more but it was impossible to have another bite. Starting on the left going clockwise, dark chocolate truffle, strawberry macaroon, espresso macaroon, chocolate lady bug "macaroon" , Pistachio cupcake with marshmallow topping, pistachio chocolate truffle, white chocolate (something), miniature coconut cream pie. I've never had such a magical experience for dinner. The service was beyond anything else I've experienced by a long shot. My water glass was never empty and half the time I didn't even notice it being refilled. There were easily six people attending to our table. They struck a perfect balance of being attentive and not intruding on a romantic dinner. I'm glad to have checked this off my todo list a very memorable experience. Finally a food post! I'll admit this one has been on the backlog for posting but with all the travel it's been very difficult to get back on track. In my quest towards a healthy low calorie lunch box I was inspired with my previous use of soba noodles and Abalone mushrooms (King Oyster). Here I aimed to use the mushrooms as my protein and grill it to give a visual appeal of grilled tenderloin. The meaty texture of the mushroom is often used to substitute for animal protein and it's also a huge savings on calories. I cut the mushrooms into 3/4" thick rounds and marinaded them over night. The abalone mushrooms give the dish a nice meat-y texture without all of the calories. I let the mushrooms marinade overnight hoping to have the mushroom really get some of the flavor and maybe draw out some of the moisture with the use of the miso and salt. I then grilled the mushrooms on a grill pan with the green onions to give it some color. Since there was no raw meat involved I used the leftover marinade to baste the mushrooms while I grilled them. The mushrooms came out beautifully, but be warned that the marinade was really hard to clean off the grill pan. The noodles were cooked according to package and tossed with a light dressing. This recipe is vegetarian (and depending on where you stand on honey, vegan in some definitions. I suppose you could substitute with sugar if you wanted). Not too bad for 350 calories! Edit: Oh wow, I just noticed, this was my 300th post. 1. Combine miso, water, vinegar, honey, ginger, garlic, salt and pepper in a small bowl, stirring with a whisk until smooth. 2. Toss marinade with abalone mushroom rounds and store in a plastic bag for at least 8 hours up to overnight. 3. Cook noodles according to package directions; drain. Rinse with cold water; drain. 4. Combine Sesame oil and lime juice add toss with noodles. Sprinkle on sesame seed on top and toss. 5. Heat a grill pan over medium high heat. Coat pan with cooking spray. Grill mushrooms in one layer 3 mins per side until mushrooms are soft. Grill onions until wilted. Baste the mushrooms with marinade while grilling. 6. Plate noodles with grilled mushroom and onion. It seems that I'm doing more travel than I'm doing cooking this year. Heck, I still have a couple of posts from the last trip that I never finished. (One features a visit to a chocolate museum in Belgium) I still have a couple of cooking posts that I haven't managed to post either. I'm a bit behind. As you can tell from the title picture we're in Sydney, Australia! This is a view from a harbor ferry of the opera house. 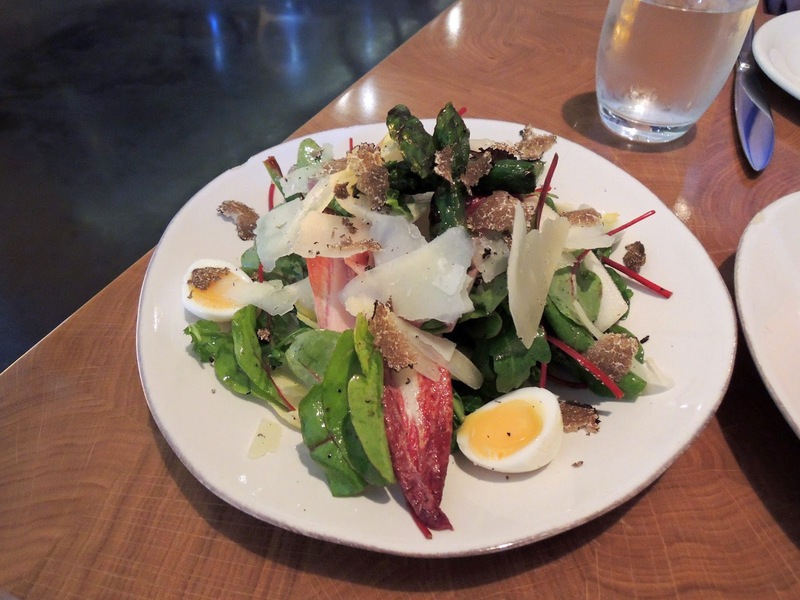 This was a two week visit but I'm going to consolidate it into one post and skipped a few of the places we ate at (I left my camera in a few instances). We landed 6 am and since we had time to kill before checking in (and had to keep ourselves awake) we walked down to Chinatown and got some Yum Cha (Dim Sum) at the Emperor's Garden. It was ok, the fact of the matter is it was the only thing open so we couldn't be too picky and since we didn't have a fridge we couldn't order a lot to check out the variety. Here's a picture of a crab at another restaurant window (not open) pictured is my wife's fist to give you a sense of the enormous size. We hit the Taronga zoo and sprung for the "Koala encounter" we were allowed into the pen where the Koala's slept, no touching allowed but we did get close enough to be within inches of the cute little fuzzy ear animals. This is a picture of the mother, I twitter posted a picture of the 1 year old baby. I have a picture of us next to the baby it was literally the size of my head. So cute. I highly recommend visiting the zoo especially the Bird show, they managed to train birds for an interactive show it was simply amazing we blew a whole day there. We had fish and chips at one of the restaurants in the zoo, nice but didn't warrant a picture. The hotel had a basement area with a Pizzeria, seafood restaurant, sushi, greek and Tapas restaurant. I hit most of them but did get pictures of what we had at the tapas bar. 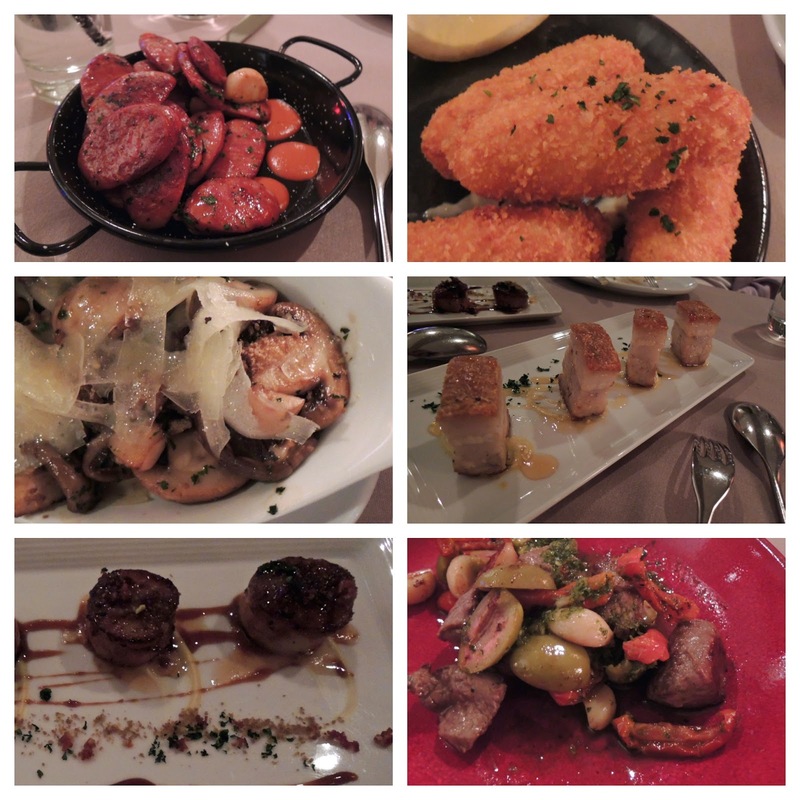 Featured in the picture: Grilled chorizo, salt cod croquettes, sautéed mushrooms with manchego, pork belly with honey, Pan fried scallops wrapped in Jamon serrano, and Grilled lamb served with confit garlic and green olives. "Pro Tip" (or don't make our mistake): if you want water like in America ask for "tap water" or get charged for an expensive bottle. After the Zoo we figured the Aquarium would be an equally impressive place to visit. Here's a picture of a Dugong it's a relative to the American Manatee. They are highly intelligent and cute as hell. You can't resist smiling back to that face. We elected to take a behind the scenes look at the aquarium it was neat but you don't get to take pictures. My friends suggested that I try some kangaroo so we went to Meat and Wine Company. Apparently kangaroo are much like deer at home in Texas, a cute but enuisance animal. 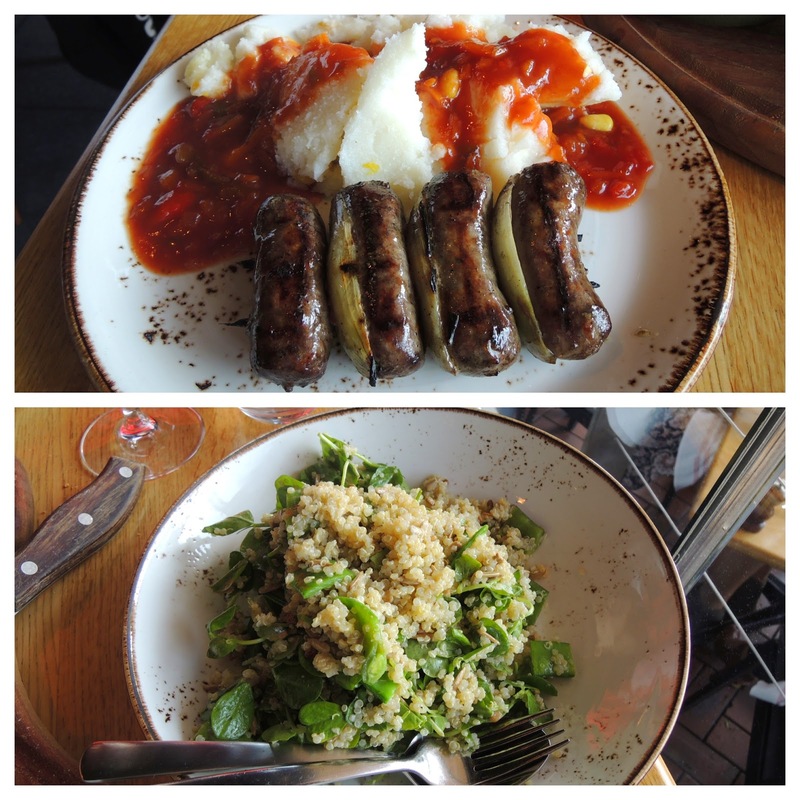 For appetizer we shared African Sausage with Mielie pop (a hominy porridge) and Quinoa and Snow Pea salad with sunflowers and white wine vinaigrette, this was delicious and something my wife asked me to replicate. Finally the Medium Rare Kangaroo fillet. I have to say it was pretty tough and had a very iron/liver-y/gamey flavor very distinct and unique. Glad I tried it, I might have to try sous vide and different marinades and preparations. Again, off the recommendation of my friends I hit the Sydney fish market. It was a bit smaller than I expected but it was chuck full of oysters. I settled on lunch picking a box of my favorite Uni (sea urchin) and some fresh abalone. The uni was very clean tasting with a hint of salt water the abalone was very crunchy without a distinctive flavor. I was in heaven eating the uni! 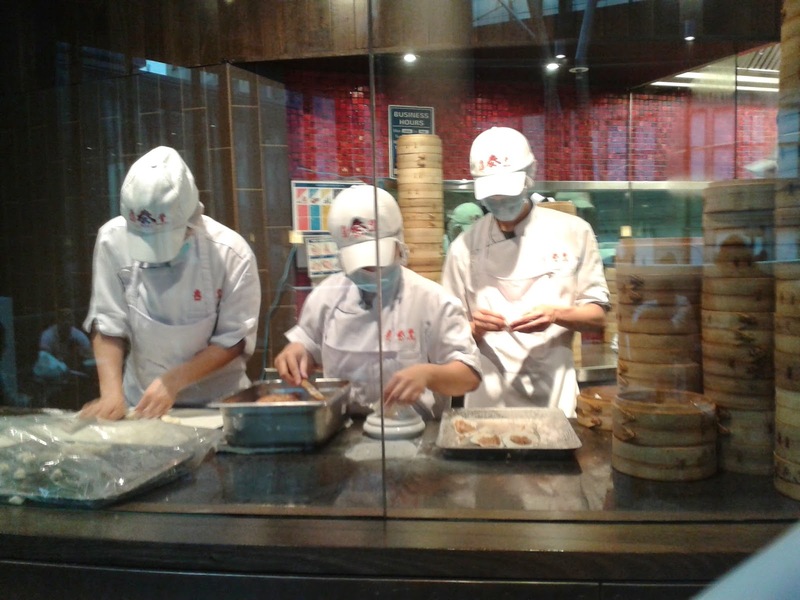 Finally, I was very excited that Sydney hosts one of my favorite restaurants Din Tai Fung. Not just one of them but three! I visited their Taiwan branch with my inlaws and had to stand in a 2 hour line to get they're famous Xiao Long Bao. The production photoed above is in the "mall food court" the guy on the left was rolling out the elastic dough, the lady in the middle was putting in the filling and measuring it on a scale and the last guy was pinching the dumplings together occasionally someone would help him as that seems to be the bottle neck in production. I ended up going a total of four times while I was here. Above was a meal of Red braised beef noodle soup. Xiao Long Bao, and Fried taro dessert. It was a lovely visit to Sydney, the weather was spectacular and there is so much to do. Be prepared for a lot of walking if you come to visit but the land down under has a lot to offer we didn't even get to the beaches! Something I highly recommend if you take the cruise we were on is to take the Anne Frank House tour. Unfortunately no pictures allowed, so I got one of a statue of Anne Frank outside the house. The tour lets you bypass buying tickets a month ahead online and standing in a crazy 4 hour line. We basically shuffled in before the museum opened and got to see the whole thing. You can't go to Amsterdam without taking a picture of a windmill. I was only able to snap this picture of the back of a windmill as we were driving around. There's a lot more to these windmills than I figured. 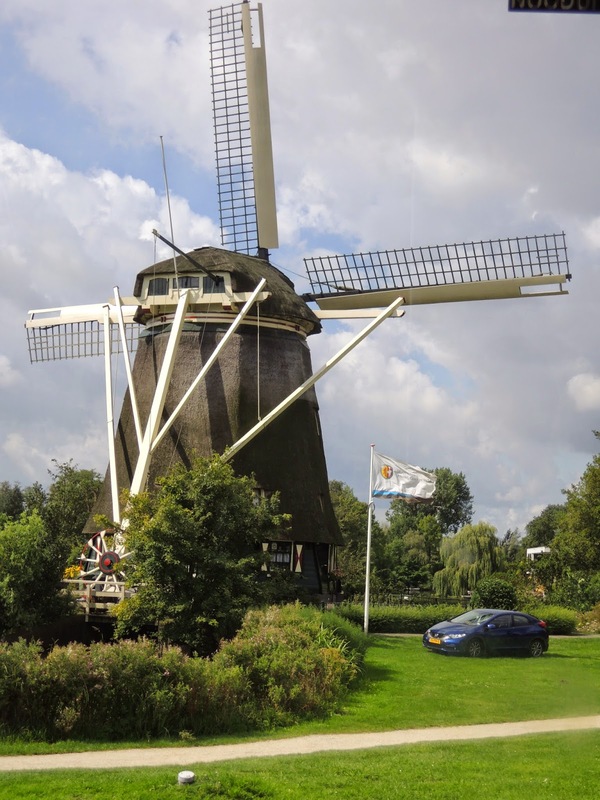 Yes a lot of the original windmills were a local place for people to bring grains to be milled but others used the wind power for other functions such as powering pumps to keep the city (which is below sea level) from flooding. A lot of the old wind mills have been decommissioned and the remaining are now protected historical sites (that still function). People are trained to operate and maintain the windmills and are commissioned to live there. When not in operation the wind mills are locked in the "X" or "+" configuration. In the old days mills that were in need of repair were locked in the "X" configuration so that repair people could easily see who needed help. 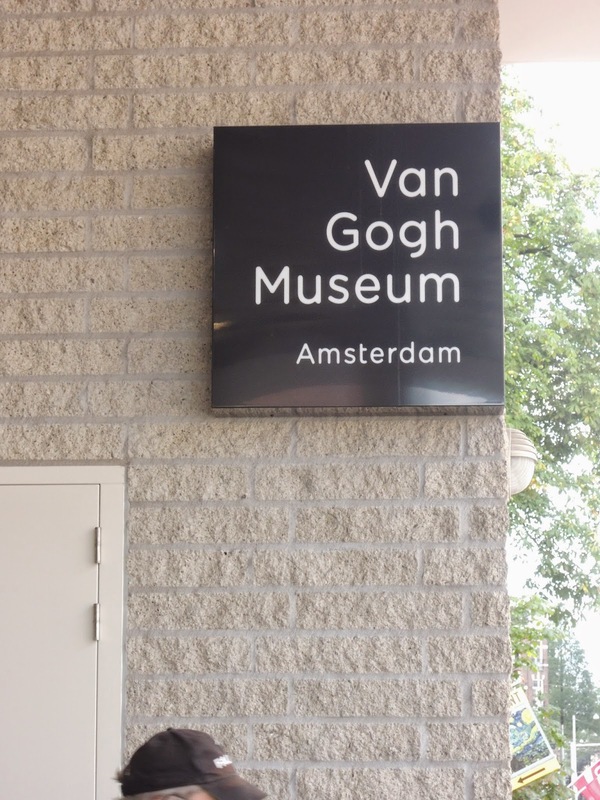 The other must see from my wife was the Van Gogh museum. Again no pictures allowed but it was neat to see some of the classic paintings I've read about and seen as photos in person. I'm not usually one for museums but this was pretty spectacular. The museum was laid out chronologically to his body of work so the audio tour was really neat to fill in the historical gaps between paintings or what was going on in his life to influence the works. To finish our we wandered into the sister hotel of the one we were staying. "Art'otel". It was a very modern hotel we actually randomly walked into the restaurant not realizing it was a hotel. It wasn't until after dinner that one of the hotel staff happily took us on a quick tour. 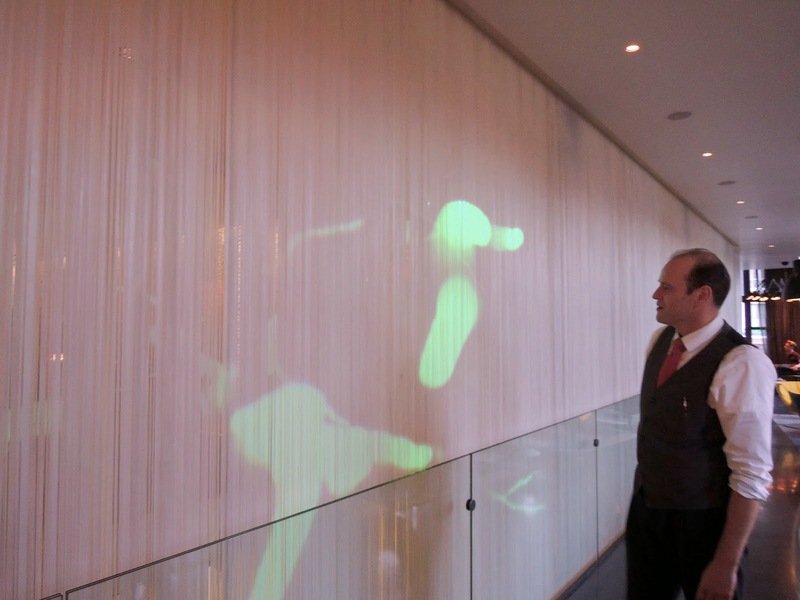 The hotel has a basement for art gallery installation as well as performances. There were large windows to allow passerby's to see and hear performances or rehearsals. Upstairs featured an interactive video display cameras watch for motion to affect the light display. The rooms were very modern and beautiful, if we come back we'll be staying here. The restaurant "5 and 33" is the main restaurant for the hotel it features italian tapas and all of the ingredients are locally sourced. The host was super friendly and gave us the run down on the place and it's inspiration. It's only been open a month or so but from our dining experience I'm expecting it to be here a while. Just like the rest of the hotel the decor was very modern and beautiful. We ordered a bunch of small plates, the food was so awesome I decided to show each dish. Burrata, heritage tomatoes and basil - their take on a caprese salad. 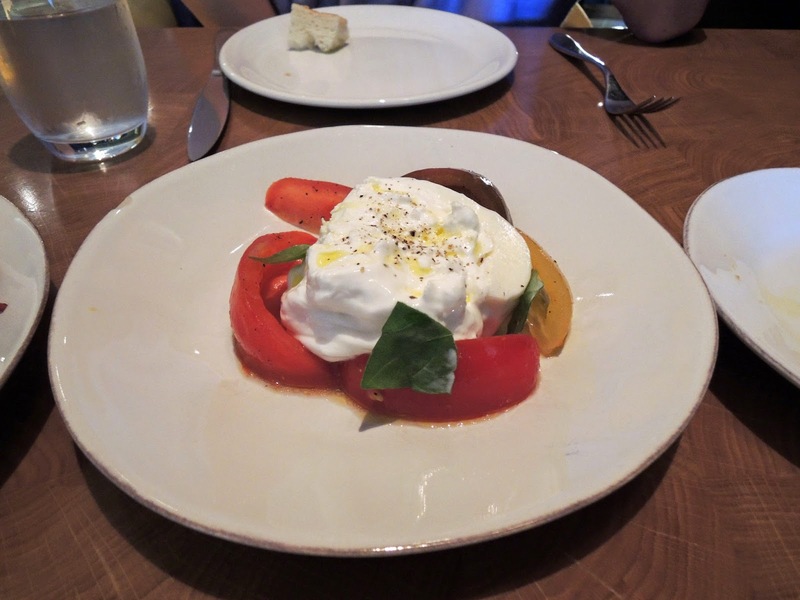 The Burrata cheese was delicious and generous and the tomatoes were sweet and juicy. An impressive first start. Green pea soup. The soup had a very "vibrant taste". 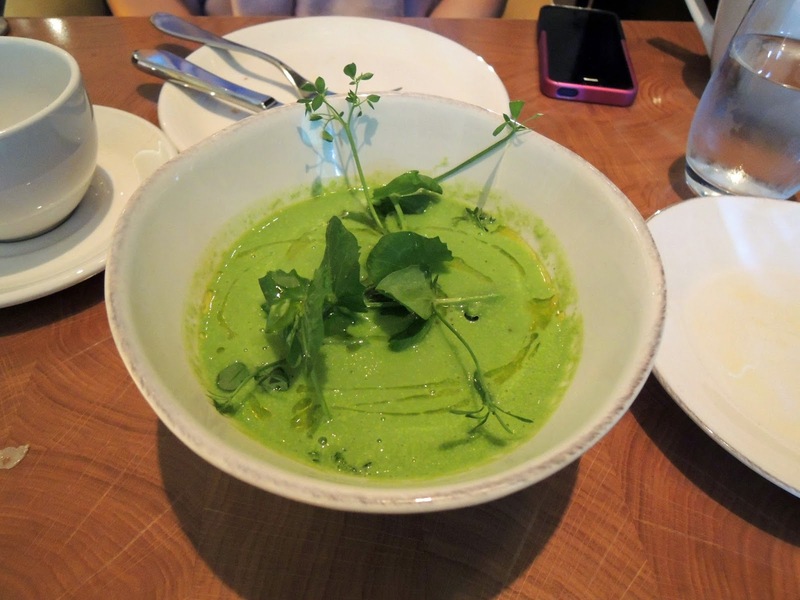 We loved this dish, there was clearly some cream in the soup however the soup was light and airy so they probably put this thru a blendtec or vitamix to give it that clean and smooth texture. 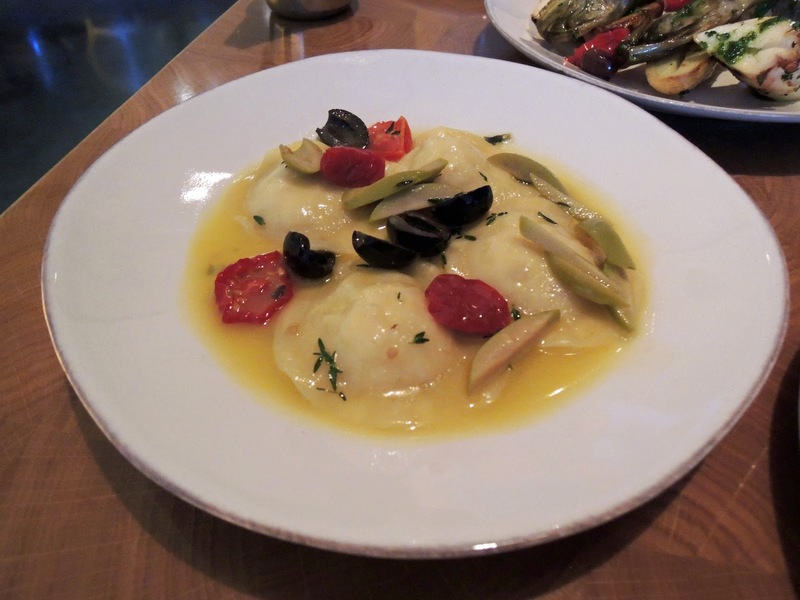 Seabass ravioli, olives and thyme. Our opinion was that the fish was too dry alone to be in a ravioli might want a little fat to go with it. 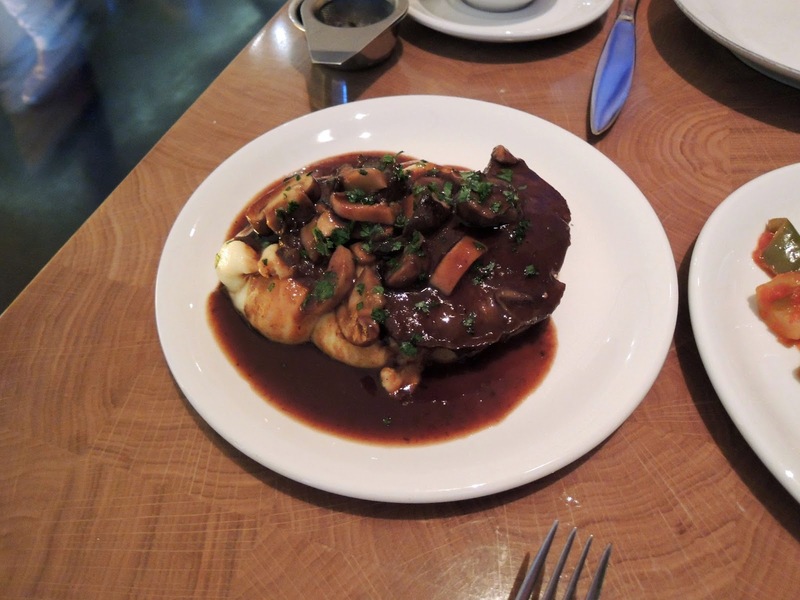 Braised ox cheeks, mashed potatoes and wild mushrooms. Wow. 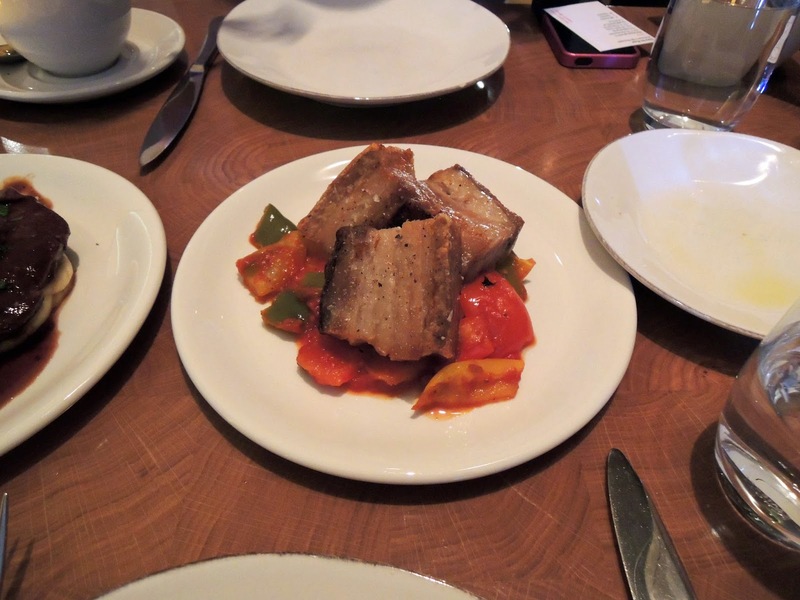 We were barely able to finish this last dish, Pork belly with peperonata. This was an amazing meal. The hospitality an service was great. Definitely go visit this place, it's right across from the Amsterdam Central station right on the square.